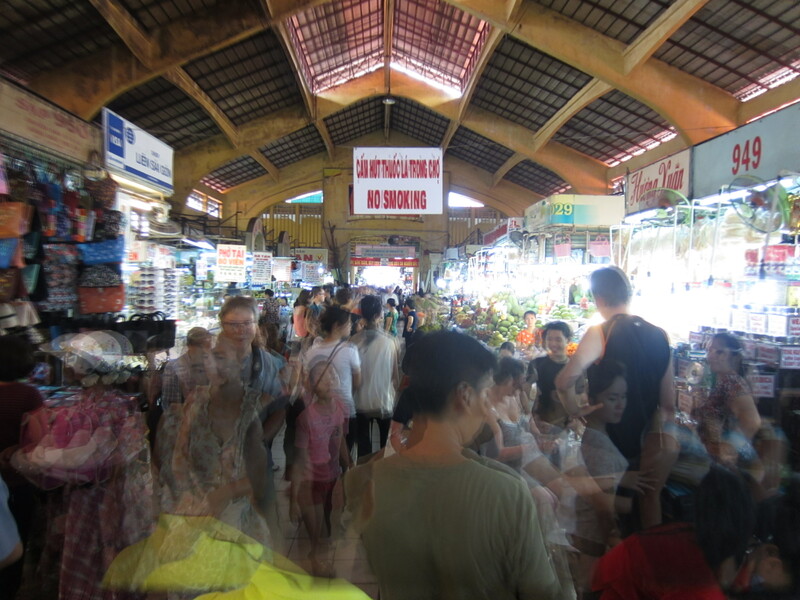 Ho Chi Minh City and the art of crossing a Vietnamese road… | more mojitos please! 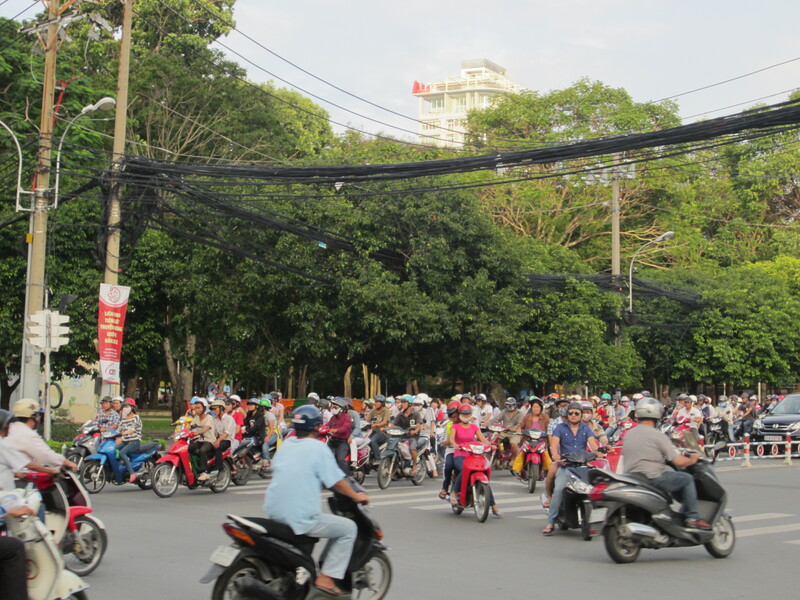 If you wait for a break in the traffic to cross the road in Ho Chi Minh City – you’re going to be waiting a long time. 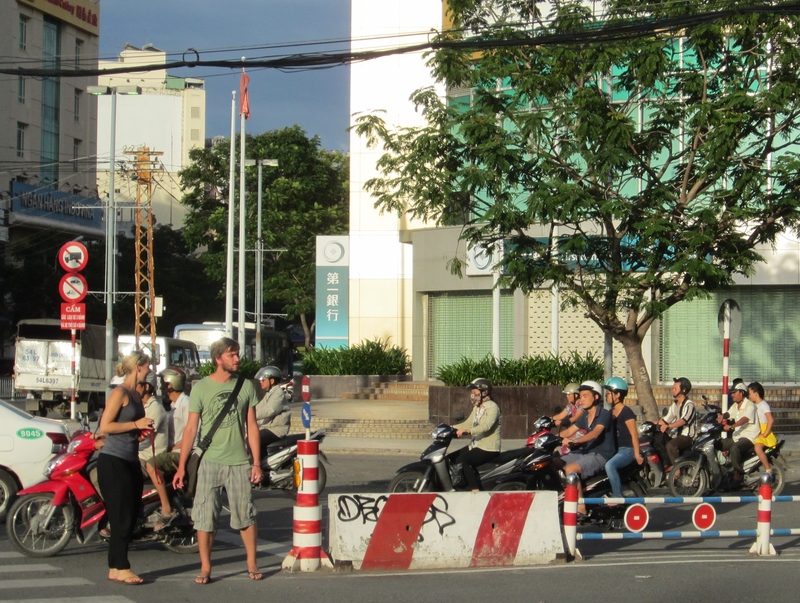 It was easy to pick out those who hadn’t yet adjusted to the haphazard and chaotic lack of road rules in the town formerly known as Saigon. Several times I spotted them, clumped together in frightened bunches, brandishing their Vietnam Lonely Planets like handbags, eyes frantically searching the steady stream of motorbikes for anything that resembled a gap. I myself was one of those for my first few days in the city. Every now and then I would tentatively put a foot forward only to have it almost run over by a whizzing, colorful, motorised blur. After multiple instances of frantically leaping back onto the sidewalk I would begin to wonder how I was ever going to make it to the other side of the roundabout alive. 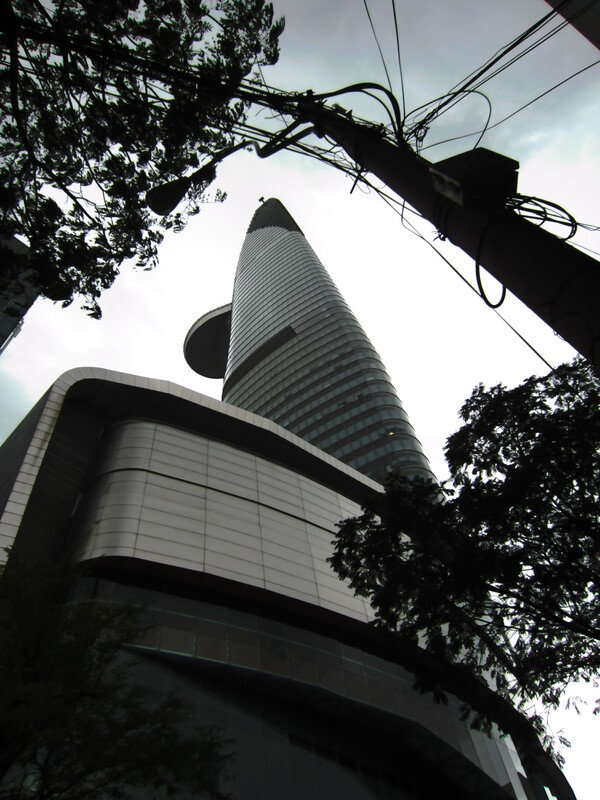 As we walked from place to place – the War Remnants Museum, the Reunification Palace, the Bitexco tower – my confidence in my ability to cross a road slowly began to creep back. I learned that you can’t wait for what would be considered a gap in traffic back in Australia as it’s simply not going to come. Instead, whenever you spot a tiny opening (and by opening I mean the smallest sliver of calm in the traffic) then that’s the time to act! Eventually I realised that if you then walk out calmly and confidently (moving too quickly will confuse the drivers), arm occasionally outstretched (just to remind them you are there) the swarm of motorbikes will somehow manage to adjust itself ever so slightly, allowing the flow of traffic to churn around you as you scoot across to the other side. Laziness prevailed when we set out towards the confronting and provoking War Remnants Museum leading us to decide to take a motorbike taxi. 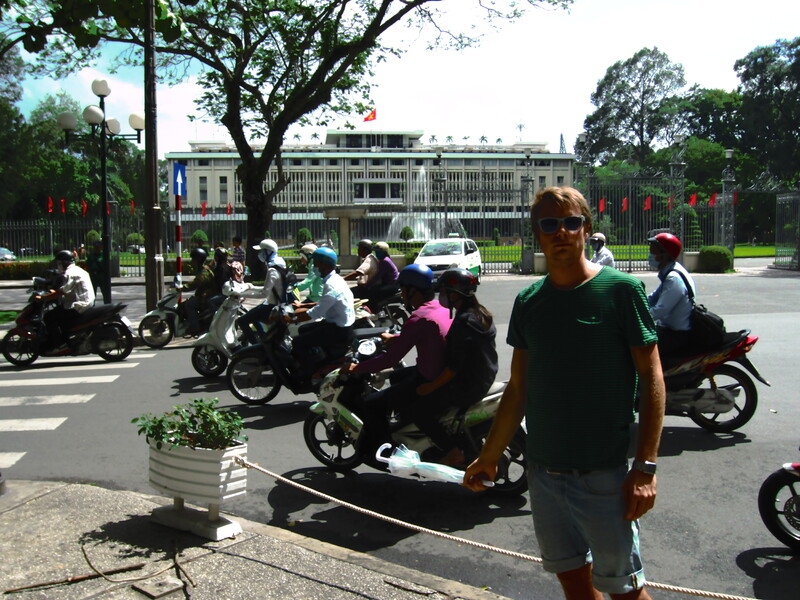 Will was wedged behind the driver and I was left sitting on the very edge of the seat behind him, clutching onto his back for dear life as we weaved and ducked our way through the crowded streets and zoomed passed the hundreds of pretty Vietnamese girls that stood chatting beside their parked Vespas. 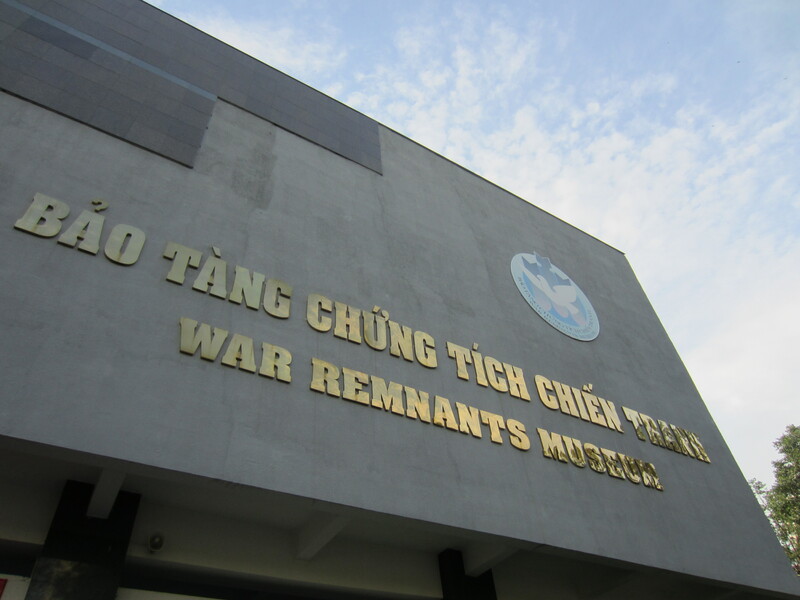 After arriving at the museum with my legs shaking and heart rate going through the roof we spent a thought provoking and sobering few hours looking over the horrific personal accounts, photos and facts concerning the atrocities suffered during and after the Vietnamese War that filled the museum. 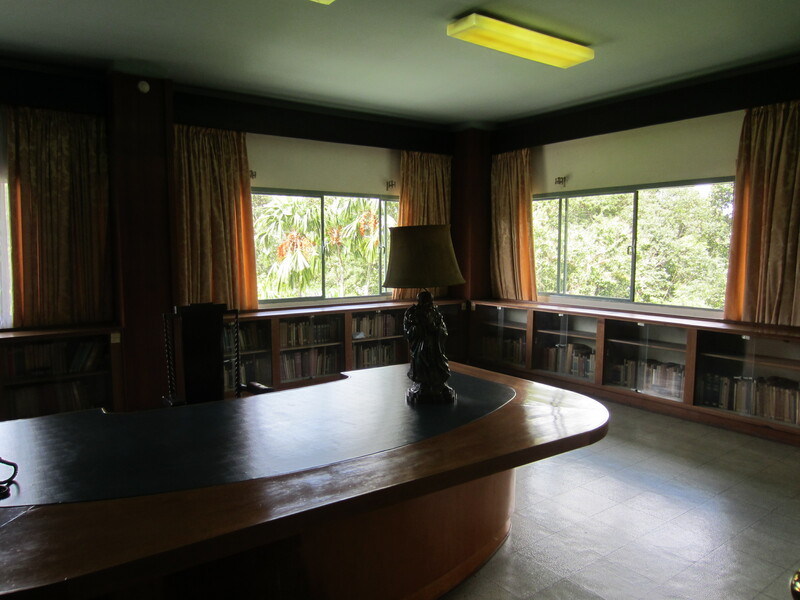 I managed my first flawless road crossing on our way to the Reunification Palace – a massive, yet bizarrely ugly building that was rebuilt in 1966 after the previous beautiful French Colonial Palace building was bombed into obliteration. The seventies are well and alive in the décor and interior design – let`s just say the colour brown is featured A LOT! Will even commented `I think we`ve just taken some of the ugliest photos of the trip` after snapping a few pictures of the library and entertainment areas! 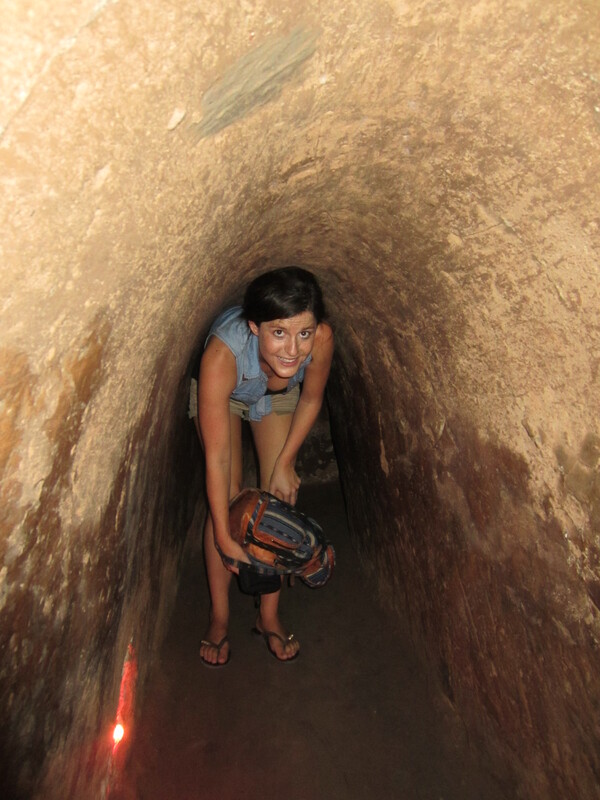 The days in Ho Chi Minh City continued with a visit to the Viet Cong`s Chu Chi tunnels where we scrambled through the stifling cramped underground passageways and viewed the ingenious camouflage techniques used for tunnels openings and traps that were set around the area. 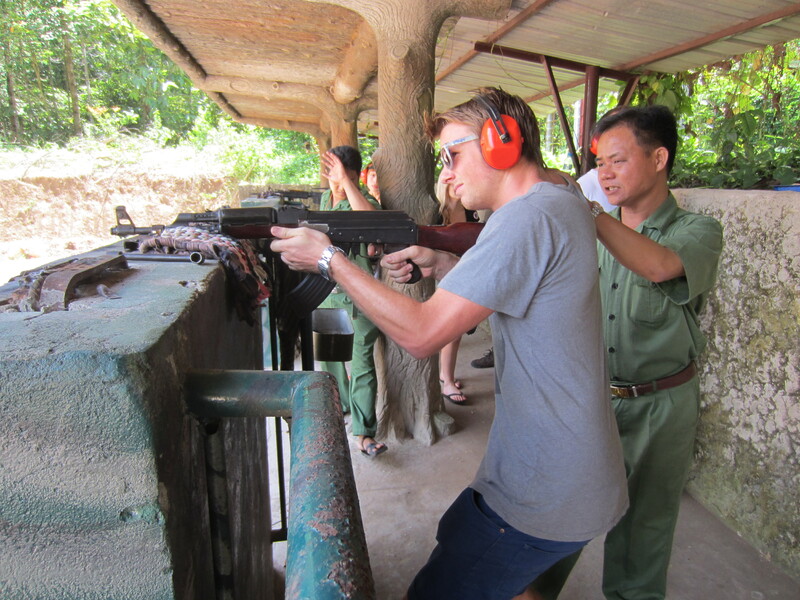 Towards the end of our visit we both even had the chance to fire one of the older style guns at some targets at a shooting range that had been created in the midst of the jungle. Another afternoon was spent wandering backstreets near the Bitexco tower filled with local street markets and a following through on my brave decision to have my hair cut at a local hairdresser. However there was one thing that, coupled with the traffic, will also forever be conjured in my mind when I think back to my time in Ho Chi Minh. The sandwiches. Oh the SANDWICHES! One of the staples I encountered on almost every Ho Chi Minh street corner was a wise looking Vietnamese woman manning a stand filled with crusty French style baguettes, various assortments of meat, pâté, cheese, chilies, carrots, tomatoes, cucumbers, onions, coriander and a selection of some mysterious fish and soy based sauces. 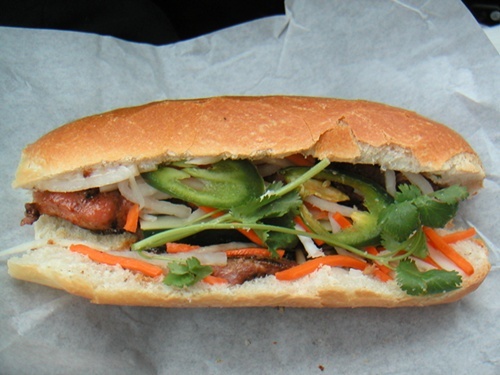 In a flurry of blunt butter knives these women were able to expertly assemble the sandwich that is known as `Bahn Mi` in matter of seconds. And what a sandwich is was! Everyone morning without fail, I would race down the tiny staircase in our miniscule hotel to the small Bahn Mi stand that stood around the corner from our building and order myself a sandwich with the lot for the red hot price of 15 000 dong (about 70 Australian cents). Will, who has not been blessed with the iron stomach that I possess, was slightly more cautious and thus usually opted for a cheese filled vegetarian option. That combination of the slightly warm, crusty bread roll, salty pâté, crunchy vegetables, rich fatty pork and tangy coriander was fairly far removed from my typical breakfast of muesli and yogurt! Honestly though, the flavour was incredible and I really couldn`t think of a better way to start a morning.